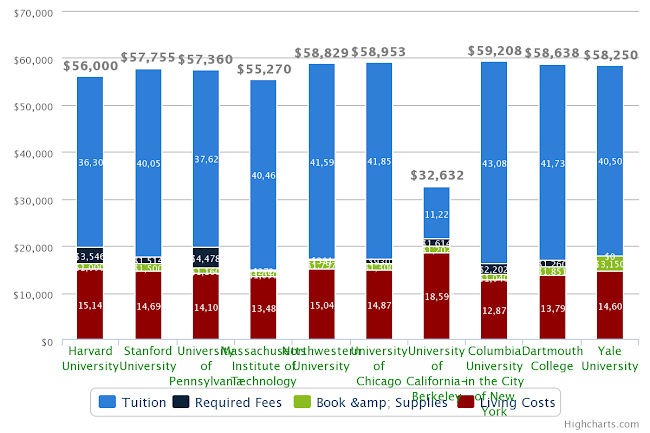 We analyze and compare tuition and living costs of top 10 graduate business schools (MBA). The top 10 schools were introduced in USNesws Education. Next Tables shows general characteristics of the top 10 graduate business schools. You can check detail tuition information of each schools by following links on the school names. Tuition and Living Costs are compared in next table. 9 of 10 schools are private colleges (in-state and out-of-state tuition are same) and the other 1 is public school. For the public school, out-of-state tuition and fees are applied for comparison.